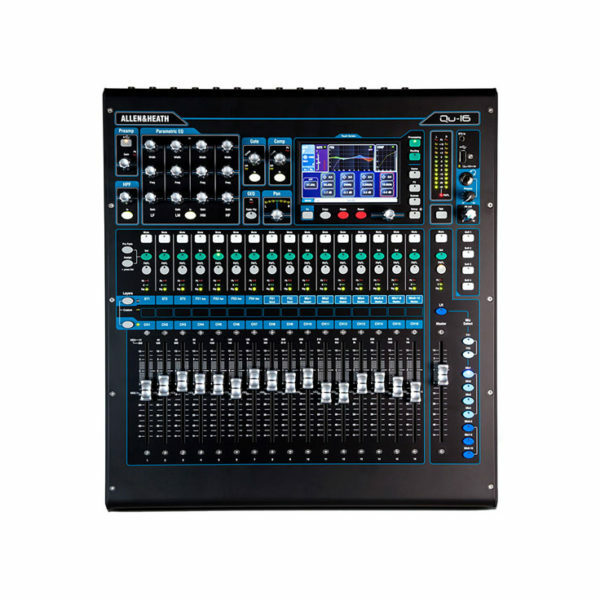 The mixer shall be a compact, rack-mountable mixer with 16 mono and 3 stereo line input channels mixing to 12 mix outputs. The surface shall include 17 moving faders with 3 layers, each layer having dedicated keys and indicators, giving access to input channels, output channel mixes, FX sends, FX returns, Main mix, and a customisable layer giving access to DCA masters and MIDI control as well as user-defined overview of channels. Each fader strip shall have a dedicated PAFL, Mix, Select, and Mute button with indicators, a 3-LED multi-point meter, and coloured LED indicating fader assignment. 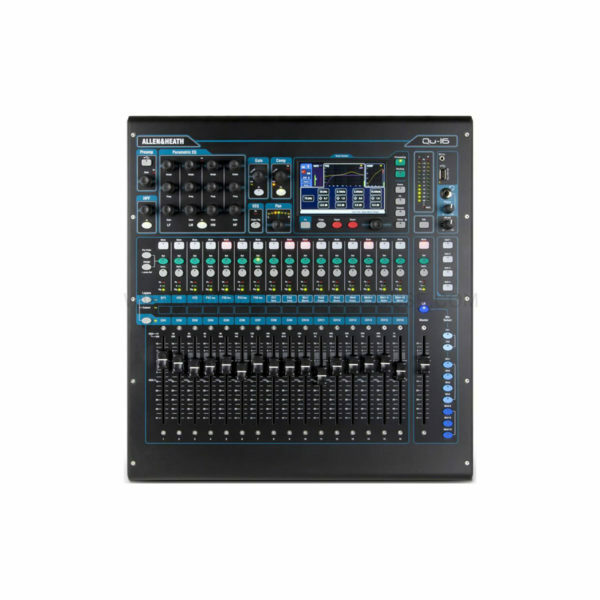 The mixer shall have a physical control per function following the select button for the input and output channels allowing for fast access to all key processing parameters. The ability to assign channel on/off status to the current mix using the channel ‘Mix’ keys shall also be provided. All processing, Pre/Post fade routing and assignments of signals to mix send, FX send and Audio, DCA and Mute Groups shall be accessed and adjusted via a 5-inch colour touchscreen provided on the mixing surface. A Channel Ducker shall be provided to reduce the level of selected channels when a prioritised input channel is in use. This channel priority shall be available across all mono and stereo input channels and also channel groups. 4 user-assignable soft keys shall be provided for quick access to Mute Groups, DCA Mutes, Tap Tempo and Scene Recall. There shall also be dedicated keys for quick Copy/Paste/Reset of mixes and processing parameters. The name and number of the current selected channel or mix shall be identified on screen when in the processing or routing pages. Send levels to mixes shall be displayed and adjusted using the faders. All output mix channels shall contain the following processing: External input, Trim, Polarity, Insert, Parametric EQ, and Graphic EQ with RTA and fader-flip mode, Compressor, Delay. All signal delays in the system shall be adjustable in Milliseconds. There shall be 4 stereo rack FX engines, 4 DCA groups and 4 Mute groups. 4 user-assignable effect racks shall be provided with a library of factory preset FX emulations. The FX racks shall be individually configurable as send/return from a channel or FX/Mix, or inserted into input or output channels. A global source option for the direct out of each input channel shall be provided in the routing screen. The tap-off point shall be adjusted to the following positions in the processing path: post Preamp, post HPF, post Gate, post Insert return, post PEQ, post Compressor, and post Delay. There shall be further global options for Follow Fader, and Follow Mute. Direct outputs shall be assignable via the mixer soft patch bay to any physical output socket interface channel or ME channel. A signal generator shall be provided with the ability to send a variable level signal to any output mix with visual assignment status on-screen. The following types of signals shall be available: Sine, White Noise, Pink Noise, and Band-Pass. Comprehensive input, output, and FX channel and RTA metering shall be provided on-screen. Real Time Analysis metering shall include a spectrogram to allow for accurate monitoring of audio energy across the frequency spectrum over time for the purpose of feedback detection and correction of room acoustics. A default Mains to PAFL sub-mix shall be provided. 12-LED bar meters on the surface shall indicate the 3 Main mix buss levels, the PAFL signal shall override the LR meters accompanied by a PAFL-active indicator. A Talkback facility shall be provided with the ability to send to any output mix with on screen status indication. An option to enable talkback latching and HPF shall be provided. A quarter-inch jack socket for PAFL headphones output shall be provided, with an analogue output level control. 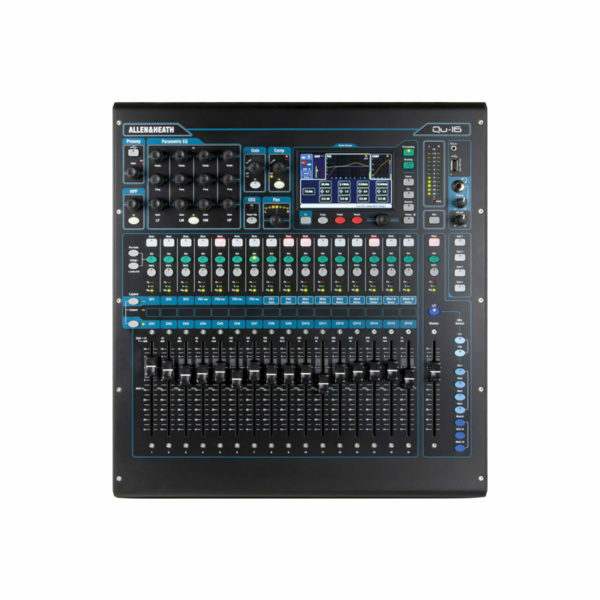 The mixer shall include stereo and 18-track recording/playback to optional USB hard drives. The format shall be 48 kHz/ 16 bit WAV. 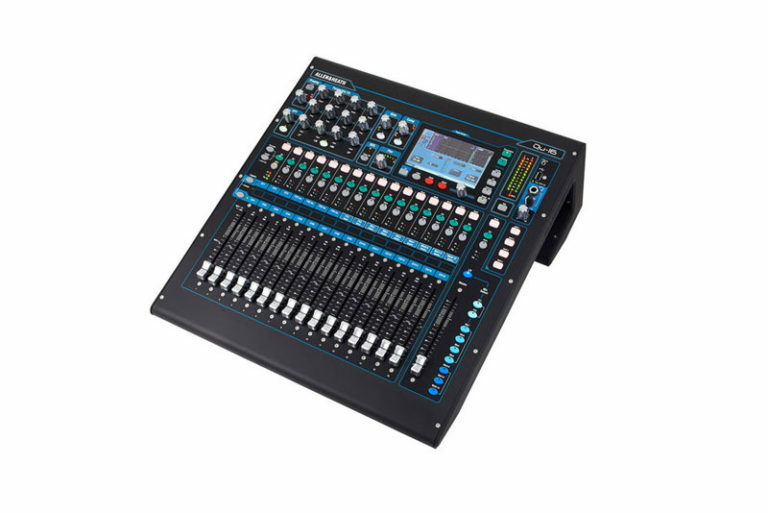 The mixer shall play back stereo WAV files at 44.1 or 48 kHz and shall have a USB Type-A connector on the surface for recording, playback, data-transfer, archiving, and firmware updates to USB drive. On the rear panel there shall be a Type-B USB connection following the high-speed USB 2.0 standard for multi-channel, bi-directional audio streaming of 24 out / 22 in and MIDI DAW control between the mixer and a computer. A DAW transport control using popular DAW control protocols for computer shall be available via the touch-screen. 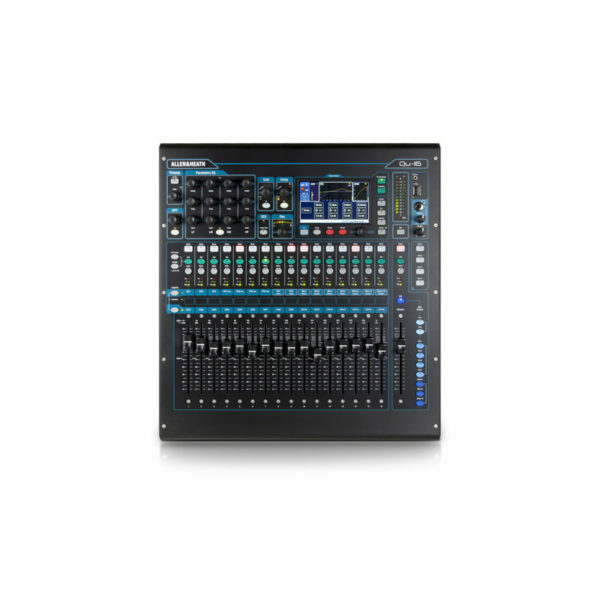 The mixer shall provide a Fast Ethernet (100 Mbit/s) port for Cat5 cable connection to a computer for MIDI over TCP/IP control of mixer parameters via a wireless router (access point) for live mixing control. The mixing system shall include application software for Apple iOS touchscreen devices connected via a wireless network router to the LAN port and allow control of functions including the preamp gain, pad, and phantom power. These applications shall have a graphical representation of physical controls and indicators present on the surface including signal processing parameters and shall provide control of output channel processing including Parametric EQ, Graphic Eq, Compressor and Delay. Routing assignments and level adjustments of input signals to all mixes and bus shall be provided. The application software shall provide signal metering and processing threshold indication when online including the Real Time Analyser. There shall be a local “dSNAKE” Ethernet audio expansion port with locking Ethercon connector, providing up to 22 input signals and 12 output signals, plus 40 personal mixing sends to be connected over a single cable ‘digital snake’ and allowing Remote Preamp control to an Allen & Heath AudioRack, or Allen & Heath ME Personal Mixing Systems. Input and output channel processing and parameters in the mixer shall be saved on demand as a user library item for recall in other channels. Individual processing sections shall be save-able on demand as user library items for that type. All library items shall be stored on board and archived with the show-file. Library items shall be transferrable to USB drive as portable data to be used in other systems. The mixer shall provide the facility to save 100 scenes of the settings of the mixing system and these scenes shall be nameable. A comprehensive table of Scene Safes shall be provided to prevent selected items from being changed from their state when the safe was enabled. A comprehensive scene filter shall be provided per scene to Allow / Block each parameter saved in a scene from being changed as that scene is recalled. An option shall be provided for password protection for log-in of several users with different levels of system access and permissions. A particular scene may be chosen to be recalled per change of user-login if desired. The mixing system shall periodically record all current settings and return the mixer to that state after reboot following a power-cycle. 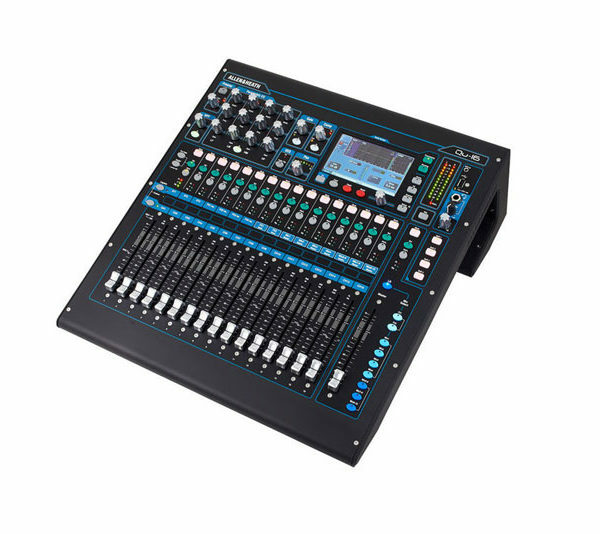 The mixing control surface shall have a built in power supply accepting AC mains voltages of 100~240V, 50/60 Hz, 95W max via an earthed 3-pin IEC male connector mounted on the rear chassis. A Two Pole Push-Button switch shall be provided near the mains input. Recommended operating temperature for the mixer shall be 5 to 35 degrees Celsius. The mixer shall be the Allen & Heath Qu-16 Chrome Digital Mixer. Copyright © 2016 | All Rights Reserved by Friend Electronic Co.,Ltd.